Welcome to our summer newsletter, we do hope you find it helpful. We have Included an update on the recently introduced TEEP regulations along with updates of our recycling and waste products and services. Please do not hesitate to contact us on 01299 252510 or email sales@clearaway.uk.com. In March we took delivery of an additional Refuse Collection Vehicle to support the growth in our glass recycling collections. Clearaway provides dedicated glass recycling in 240 litre and 360 litre wheelie bins. For pubs, clubs, restaurants and hotels, separating glass makes economic and environmental sense and helps customers to comply with the TEEP regulations. A new regulation came into effect on 1 January 2015 which places a duty on waste collectors to collect separate fractions of recyclable materials. The regulations state that separate collections of at least paper, metal, plastic and glass are required where they are technically, environmentally and economically practicable (TEEP) and appropriate to meet the necessary quality standards for the relevant recycling sectors. The aim behind the Regulation is to achieve a higher quality of recycled products in the UK. At Clearaway we provide a mixed recycling service for our customers. This material is sorted at a high quality Material Recycling Facility (MRF), which meets the TEEP requirements. All that we ask from our customers is that only “allowable materials” are placed in the mixed recycling container. 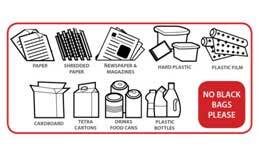 Allowable materials are paper, cardboard, clean soft plastics, cans and plastic drink bottles. It excludes glass and food and definitely no black bags. We do provide separate collections for glass and food waste. This allows a better quality of recycled products to be achieved. If you feel that you can recycle more please contact us sales@clearaway.uk.com and one of our specialist advisors will complete an audit of your wastes and recommend the best solution. 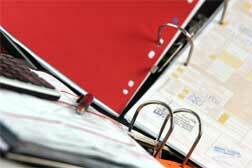 The paperless office still has some way to go but it does make good business sense to go paperless wherever possible. Clearaway emails invoices and statements to the majority of our customers, thank you. If you still receive your invoice by post, let us know your email address (send to accounts@clearaway.uk.com) and go paperless. 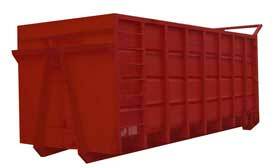 In addition to providing Trade and REL services we provide a range of Bulk containers (14 to 40 CuYd). If you are planning a factory clearout or refurbishment Clearaway can provide the right service for you. Contact us at sales@clearaway.uk.com. Our drivers and loaders work hard to ensure that we empty our customer’s bins on schedule. There are occasions where the bins are overloaded or in a place where it is difficult to move to the waste collection vehicle. Please only put compactable general waste or mixed recycling into your bin, do not overload and ensure that the bin lid can close completely. It is not safe to move the loaded bins up and down steps and slopes or across loose ground.